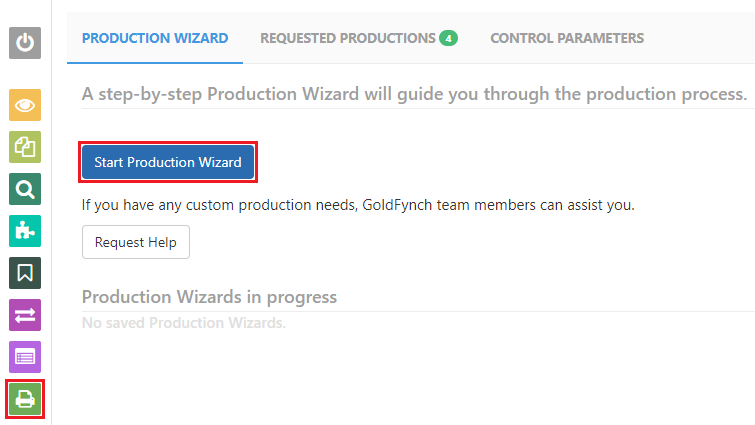 Learn how to use GoldFynch’s Production Wizard to produce your files. 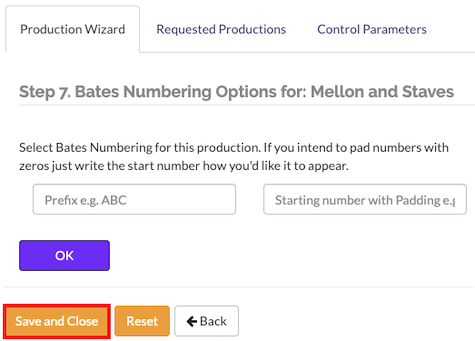 Enter a name for the production into the box then click on the OK button. You tagged your files while reviewing them. GoldFynch now lists these tags and the number of associated documents. 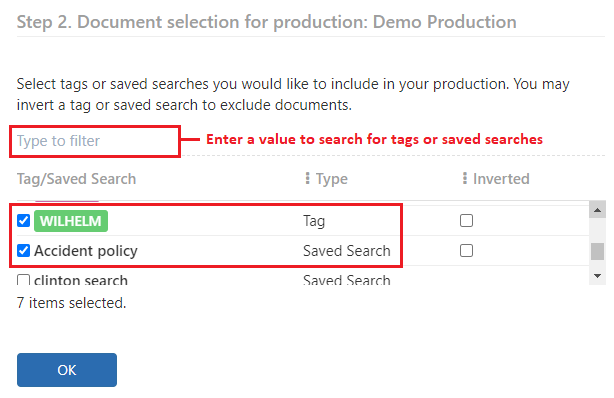 Click on the tags assigned to the documents you want to produce. Once done selecting tags, click on the OK button. GoldFynch offers you a number of different output formats for your productions, both with and without load files. Native files: Produces files with the same content and formatting they had when uploaded. (I.e. identical to the uploaded files) So, Word documents will be unchanged Word Documents, emails will be emails, etc. NOTE: If you choose a production format that includes load files, select a load file parameter profile from the drop-down menu. To learn more about productions with load files and how to customize their parameters, click here. After choosing a format, click on the OK button. 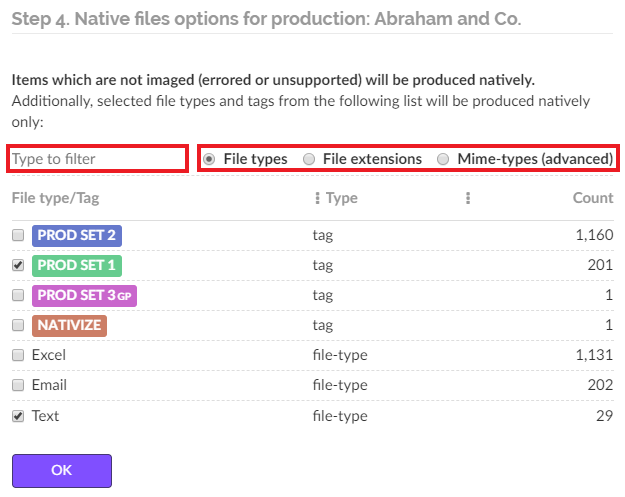 If you want to create a non-native production, but wish that specific file types are produced in their native state, it is possible to do so. Once you’re done selecting file types to produce in their native formats, click on the OK button. The page will immediately update the order of the files, and when you generate your production, the files will be arranged in this order. GoldFynch lets you stamp non-native documents with Bates Numbers, stamps from tags, and custom stamps. Note: You may see tags other than the ones you selected in Step 2 appear on this screen. This is because some of the files you chose also had these tags assigned to them. If you don’t want these tags to appear as stamps, assign them the ‘no-placement’ option as described below. If you don’t want files with these tags in your productions at all, make sure you select them as ‘inverted’ tags in Step 2. 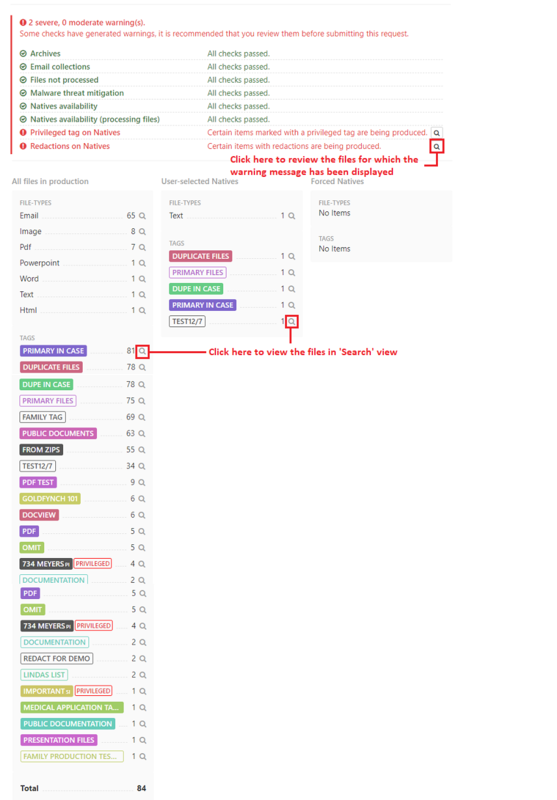 By default, when applying tag stamps, the name of the tag is applied as the stamp. However, you can edit the text that is stamped on the documents. 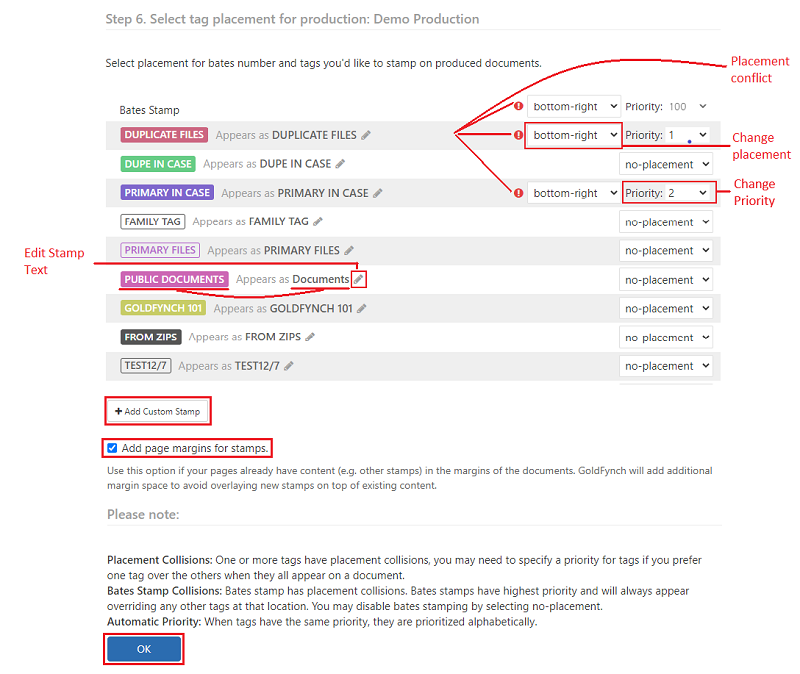 E.g., In the image of the “Select tag placement for production” step given above, documents with the GOLDFYNCH tag will have “GoldFynch Documents” stamped on them. To add a custom stamp, click on the + Add Custom Stamp button and enter the text you would like stamped on the documents. REMEMBER: Click on the OK button once you are done assigning stamps. Enter the starting number of your Bates Numbering if you wish to assign one, along with a prefix if you want one added before the number. Click on the magnifying glass next to any of the items on the lists to load all relevant items as a list in the ‘Search’ view. You will receive a notification that the production request has successfully been placed. GoldFynch queues the production and gets to work on it. To track the process, or to view any completed productions, click on the Requested Productions tab of the ‘Productions’ view. Click on the ‘Completed’ header text to sort by completion date. The completed status for your production will change from “in-progress” to the completion date once the production is completed. Once the production has finished processing and becomes available, click on the download icon against the production’s name to download the final production as a zip file. You can also sort these productions by their names, dates submitted, Bates number ranges, and sizes. 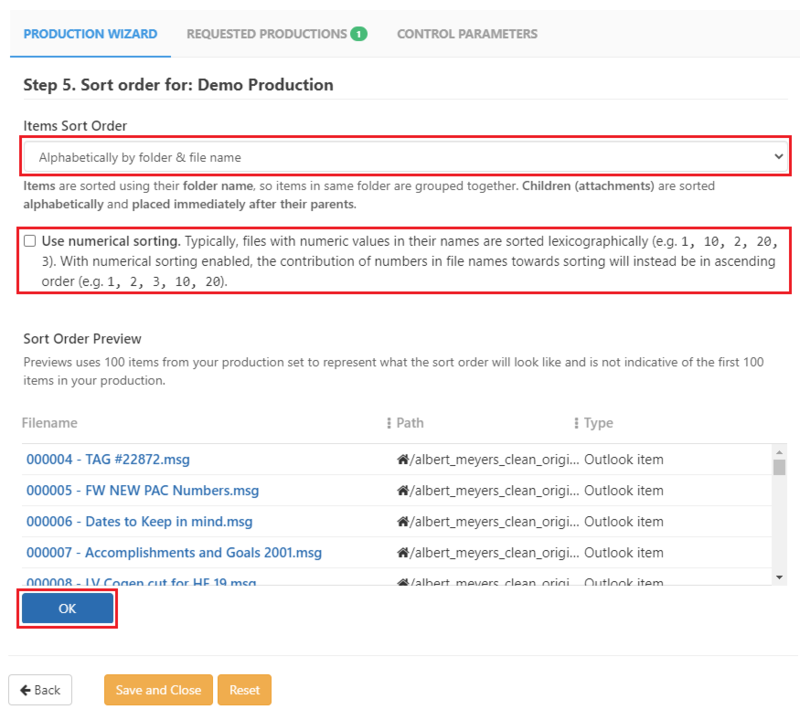 To sort productions by a category, click on the text of a header category that you want to sort by. While entering details for a production, you can save the current state by clicking on the Save and Close button at the bottom of the screen. This will allow you to pick up where you left off at any point in the future. 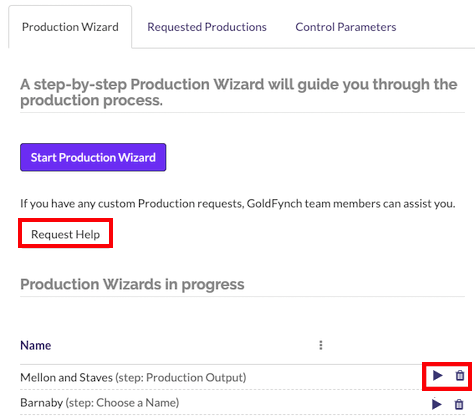 The Production Wizard tab of the ‘Productions’ view lists these productions that require additional inputs from you. The current step of production is also listed. To continue working on a production click on the play icon against it. To delete an in-progress production click on the X mark against it. It is possible to generate Concordance/Relativity-style load file formats with GoldFynch using preset, or even custom parameters. 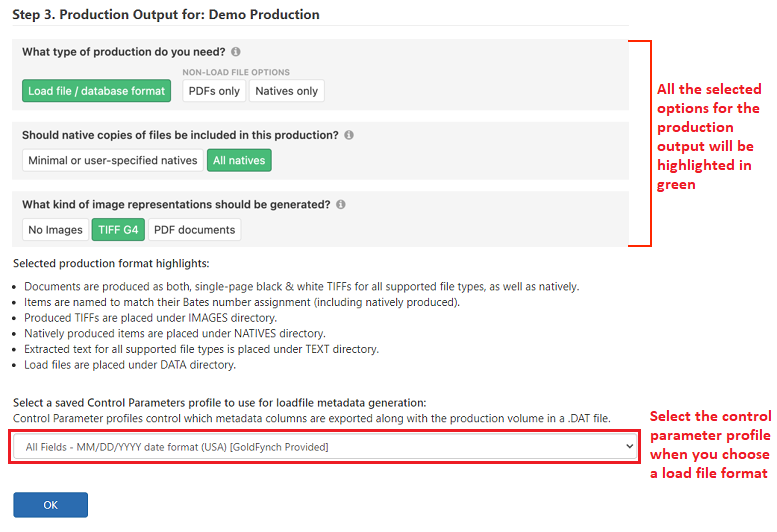 With every production, GoldFynch generates a log of information about its files to help cross-reference them. The logs also contain information on which files are in their native state, whether they have any redactions, etc. GoldFynch allows you to share productions directly through its interface, making it extremely simple to hand them over to opposing counsel. Only the final ZIP file of the production is made available to the receiving parties.